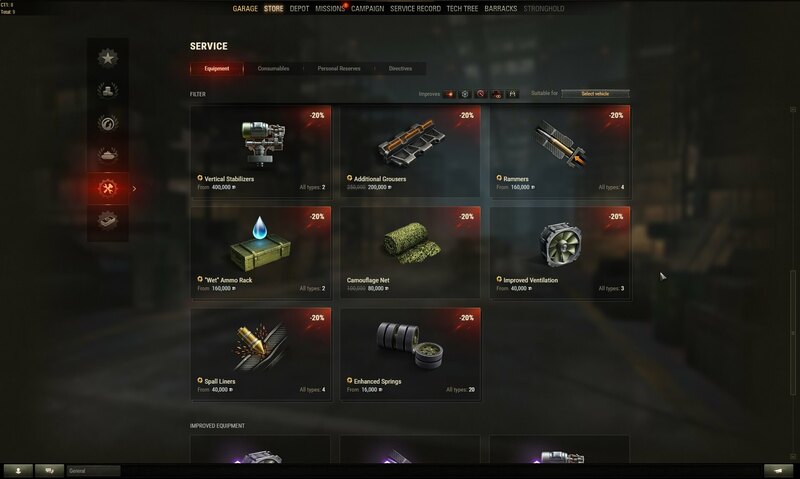 Functionality: Wargaming wants the “Shop 2.0” to become the go-to place for anyone looking to get new in-game content. For this reason, the new shop will provide extensive information about every item available. Convenience: Instead of bringing small consecutive changes, Wargaming opted for making a completely new design from scratch with the focus based on usability and the overall look. The horizontally aligned three-tab menu has been replaced with a vertical set of icons, which now only contain Shop items. 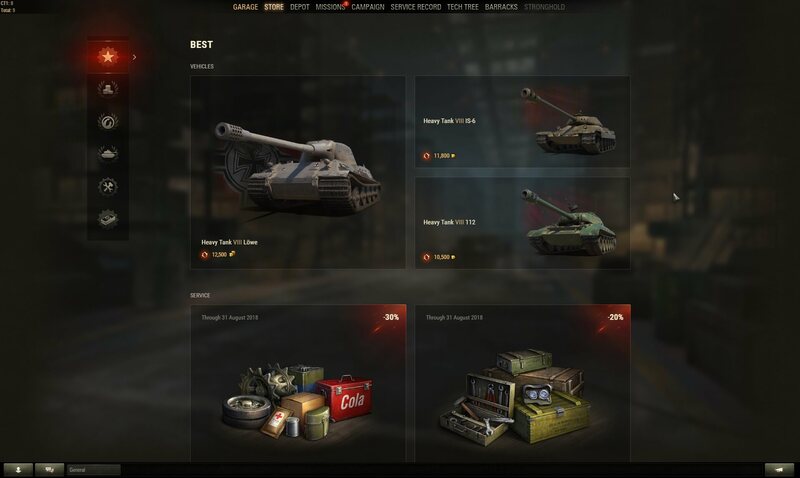 The “Depot” tab has been redesigned and taken its place in the main menu, while special offers are now part of the Shop under “Best”. The “Vehicles” section now has a cleaner look and clearer structure. The list of machines is presented in tiles and divided into several categories, reflecting bundles, as well as the Premium and regular tanks available. The familiar filter is now hidden behind the tank icon to the right of the search field not to get players frustrated with excessive visual information. Its functionality remains unchanged: if you want to search among a desired nation or vehicle class, click on respective buttons in the filter menu. Once you click on any vehicle, it is displayed as if parked in your Garage, so you can literally “try it on”. If you choose a bundle containing several machines, you can switch between them by clicking on the desired icon at the bottom of the screen. 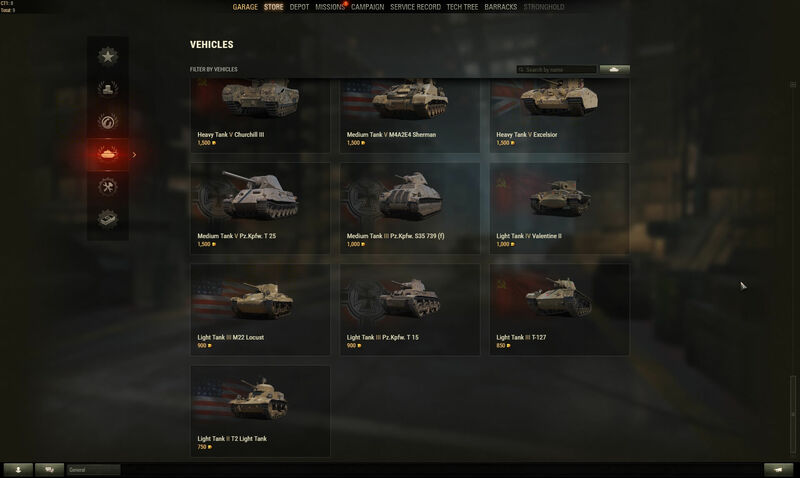 Every vehicle will feature a historical note, a list of Crew members with their core abilities, and additional bonuses with descriptions, if you’ve chosen a Premium tank. Just like with vehicles, everything is divided into blocks; items available for Bonds are arranged separately. For your convenience, we’ve created a standalone section, “Items for Bonds”, where you can seamlessly access improved Equipment and Directives. Together with this, Wargaming be running emulation of purchasing Gold and Premium Account with real money—to test the full-circle functionality. 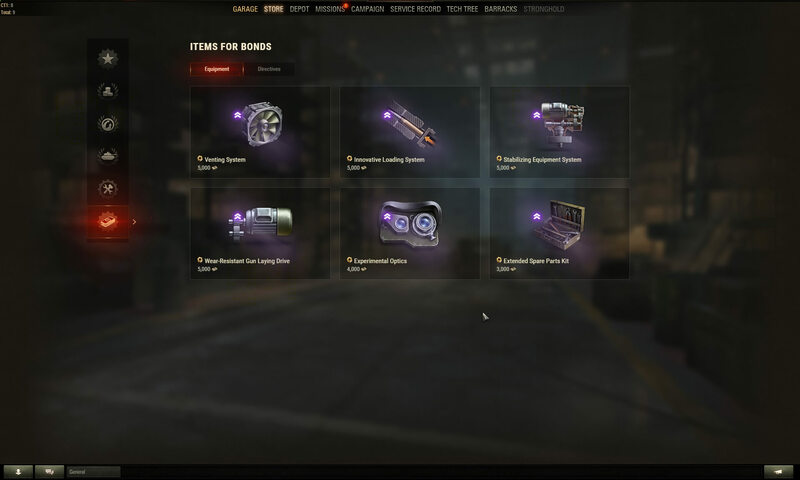 If you end up lacking Gold to purchase a Premium Package and you decide to buy more of the currency, after choosing a bundle and clicking “Purchase” you’ll head to the Premium Shop, where a payment operation will be completed. Upon release, Shop 2.0 will allow linking and remembering preferred payment methods by default, but during this Common Test, the operation will be automatic. I beg to differ. I bet it all Wargaming’s overriding objective with this is to improve the conversion rate, i.e. increase the number of people visiting the Premium Store and actually buying something rather than just browse around. In other words, it’s all about the money. A critical mind might argue that they should lower prices instead or otherwise improve the value of the offered items, but hey, let’s put some bling-bling in the shop rather than do that, right? I don’t deny the prices should be lowered, special on what it comes to “sales” of Bundles… But the in-game store always had that objective, as any company would have that in mind: more sales and easier for the end user. They are a company after all, they need to make a profit or we won’t have the game around to play. Warships already has a similar system and works quite well. So we are agreed on that. Of course you’re right, a company must always seek to get good sales, that’s what they are for. I guess what peeves me is that I don’t have the feeling that many of the tanks on offer there are worth it any more. I bought almost all of them over the years, and most of them gather dust in the garage now because I feel they are no longer competetive in the least. I honestly feel sorry for any unwary buyer who buys one of these long since powercreeped tanks only to find it is garbage. 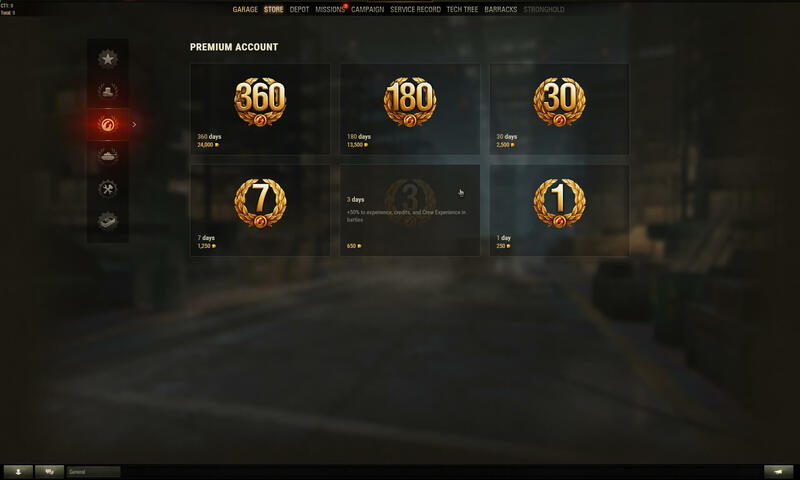 Rebate or no rebate, World of Tanks premium tanks are not cheap in comparison to MTX items in other online games. The other day I saw a player with <1k games in a Tier X match in his Panther8.8. Yes, he died within 30 seconds after launch and yes, he was a noob, but he still paid in the region of 20€ for a tank in which a much better player would have struggled to make a difference … oh, and of course, he was abundantly insulted by our team mates even before the match had started, for good measure. These things don’t feel right to me. But hey, at least the store looks cool. They will change every two days, maybe we can get some “rare gems” in there or decent ones 🙂 The only thing I feel disappointed is the fact the sales are always the same 30% for Tier VIII or 50% for Tier V and VI… Wargaming could use these “Sales” to give different bigger discounts, for example 50% on Tier VIII for one day… Sell cheaper and more, more profit.